A beautiful, lasting bunch of flowers! For this one, I was asked to paint a large commission by a man who wanted a special gift for his wife. How lovely! A grade A student at husband school I think! Very excited I was to begin this one. It had been a while since I had painted such a large canvas, and painting flowers is my favourite. The brief was simple. His wife’s favourite flowers were poppies and he brought in a vase from home from which I was take the colour scheme. Timescales were precious for this piece as he wanted his special gift for an anniversary date, and I was due to give birth imminently! So I got straight to work right away. My customer chose a large 48 x 24″ canvas. A perfect size to go above the fireplace where he envisaged it being hung. It’s important to think about where you will hang a piece of artwork, before you commission it as this plays an important part in how it will look. I can help you with this if you are unsure or not very good at visualising things. I researched images of poppies, both on the internet and from my own personal bank of floral photographs I have taken – I have a lot! I sketched out rough visuals and discussed these with my customer. Once he was happy, I commenced painting! I used several techniques in this one and began with a roller over the whole canvas, working up the colours, giving it a lovely tactile texture. 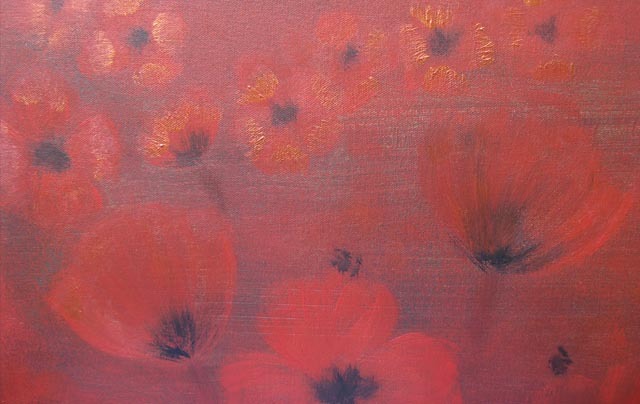 I then added the large poppies in the foreground and suggestions of a sea of fellow poppies in the field behind. The touches of copper coloured acrylic paint are really effective. I have used this on many of my canvases as it looks just gorgeous when the light catches the metallic paint, adding another dimension to the painting. I am really pleased with this commission. I would say its my favourite out of all the paintings I have created and my customer (and his wife) were utterly thrilled too. Massive man points for hubby I would think! If you would like to discuss commissioning your own piece of bespoke artwork, please contact me for a chat and I will create something beautiful – just for you.